Jazz Community Site - Jazz Team Blog » Does that build contain my fix? Does that build contain my fix? Have you ever wondered if a build includes a fix? Perhaps you’re in QA and you want to ensure you’re testing the right build, or perhaps you’re a developer and you want to make sure that your changes made it into a build. Either way, Rational Team Concert makes it easy. Step 1: Open the work item that contains the change sets you care about. Step 2: Right-click on the work item header and run Locate Change Sets from the context menu. Step 3: Open the Build view on the builds that you care about. The most common way to do this is by double clicking on a build definition in the Team Artifacts view. Step 4: In the Builds view, select the build result(s) and drag them into the Search Targets section of the Locate Change Sets editor. 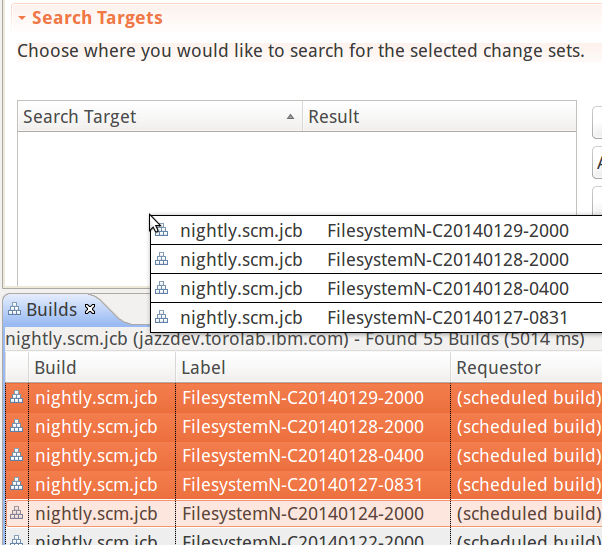 If the build result has a corresponding build snapshot, it will be added as a search target. This feature can come in handy when you’re living the devops dream and you want to verify that your latest server build really does contain a fix. See the documentation for more information on using Locate Change Sets in the RTC client for Eclipse. You can do the same thing in Visual Studio. The command line has similar functionality, but without the drag-and-drop interface. Is it possible to produce a report on what change sets are in a build, and even better, what associated work items are fixed in the build ? If you have good Software Configuration Management practices in place then this information should be reviewed by relevant stakeholders prior to deployment of the build. In the case of test environments usually by the Test team stakeholder and in the case of production by the Configuration Control Board. It is also helpful to be able to report on what has changed since the previous build and since the previous production deployment. These days with continuous integration and deployment it is really essential that these reports can be automatically generated to ensure the tempo of the project is not slowed. Yes. You can compare builds via the Eclipse UI, which will give you a listing of all of the change sets added (or removed) since some reference build. The listing can be exported into a human readable document.